For John and the other residents of Willow Creek Drive, the breakdown of social order throws them back to the 1800s. As the community tries to come together, a powerful outside force appears that threatens their survival. Will John’s years of military and prepping experience be enough to keep them safe? 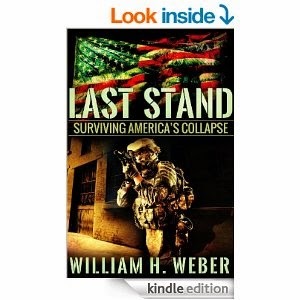 Mixing tons of useful prepping tips into an action-packed story, Last Stand: Surviving America's Collapse is a must-read for any fans of survival fiction. For some reason I've developed a sudden craving for post-apocalyptic stories and whilst browsing through Amazon this book caught my eye. The title really is self explanatory and focuses on an America that is suffering from an EMP attack. The story centres on John and his family as they try to survive in a world where all electrical items have become meaningless. As post-apoc books go this one follows in a similar vain to most others, i.e. ex-military man who happens to be a survival nut. But I enjoyed the book nonetheless. The writing was crisp, purposeful and didn't waffle about on flowery prose. The storyline was enjoyable and flowed nicely at a natural pace. And I even appreciated the fact that the author didn't try and write an encyclopaedia on every gun the main character used. What I also liked was that Weber kept the book relatively light in terms of violence and didn't resort to cheap shock tactics to try and enhance the plot. The story was told in first person which added depth to John's character but as a result it blunted everyone else's personality and in the end they just felt like cardboard cut-outs. For those of you looking for a short post-apoc book to read over the weekend or on holiday then I definitely recommend this book. It's not heavy and the pages do fly by.